Note: This DIY KL kit does not include E6000 glue or the hot glue gun (click to purchase). Click to purchase the LIBERTY Rhinestone Headband Kit. Oops, sold out! Check out our available items here. 2. Turn switch on the hot glue gun. Once you start seeing hot glue gun oozing out of the metal nozzle (don't touch! ), this is an indication that the hot glue is ready to be used! 3. Here, quickly slather some hot glue onto the bottom of the rhinestone. 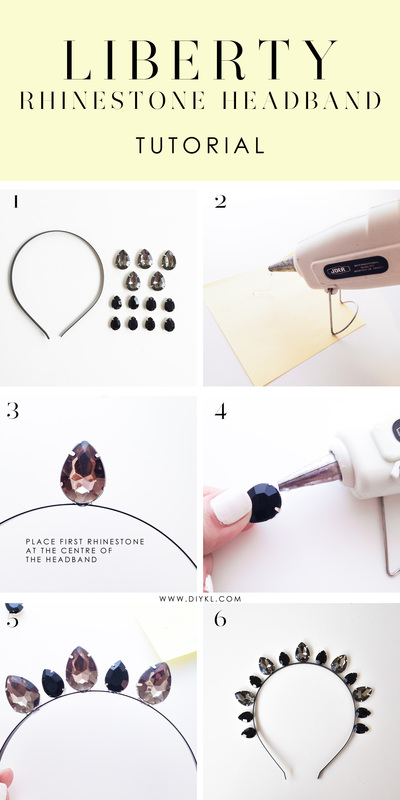 Whichever sized rhinestone you use, always start to attach the rhinestone in the middle of the headband for more symmetry! Let it dry for a few moments (you will notice the glue is drying when the glue turns opaque and no longer clear). 4. Continue with the rest of the rhinestones! Make sure you leave a small gap between the rhinestones. This is to avoid the rhinestones from touching each other when the metal headband is bent to be worn. 5. Let the rhinestones fully dry before wearing and enjoy! Be a figure of freedom in your LIBERTY Rhinestone Headband!